When I was a kid, G.I. Joe's were among the legions of action figures my brothers & I would collect. I used to save all the blister card packages, with info about the characters & admire the art on the box. On Superpunch, I saw this awesomely humorous concept for a G.I. Joe-style line of toys called "Battle Babies." 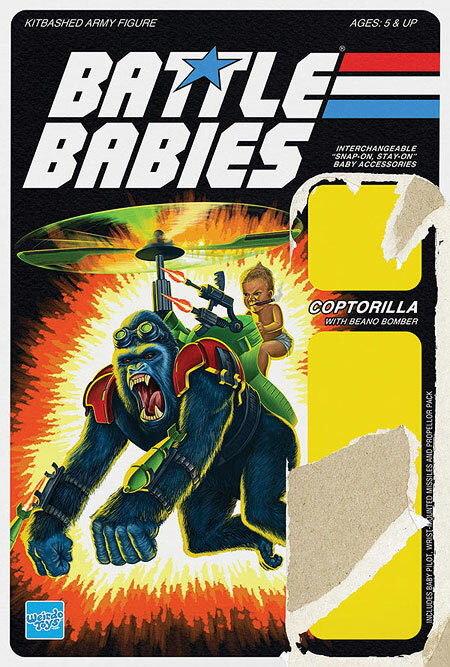 How could I not post this picture- of a cigar-smoking baby, shooting weapons from the back of a gorilla flying with a helicopter pack?!?!?!?! 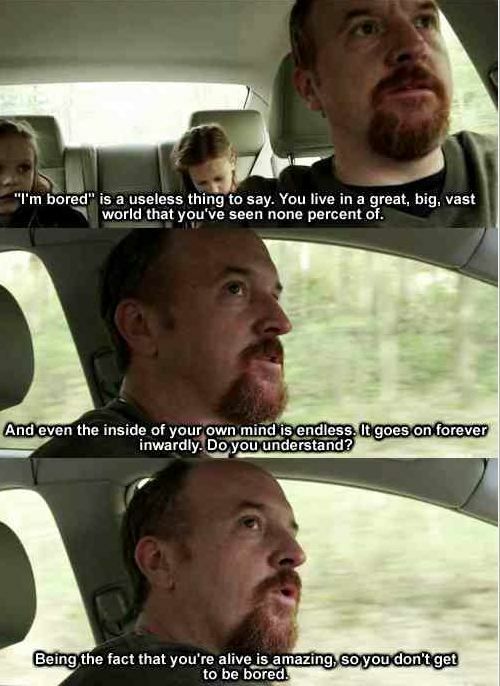 I've posted before on the idea of "boredom", but I saw this rant by comedian Louis C.K. which is even more to the point. Someone who says "I'm bored," is basically saying "I can't stand myself." A calm mind is not perturbed by inactivity. Since getting an iPhone, I've been able to browse the App Store to find downloads that may be fun, useful, & informative. I'm not really into too many games, since I'd rather play on a larger screen. Some of them are pretty good, though. Reading on the iPhone is actually not bad, & I'm currently reading the version of "Thoughts on Life & Art" by Leonardo da Vinci in iBooks. I am starting to work on getting my own game app developed, for the award-winning strategy game I created as a college student, "Da Vinci's Challenge™" The gameboard is a pattern of circles known as the Flower of Life, that was studied by Leonardo in his codex drawings. I have been downloading other Da Vinci based material to help inspire this effort. Now that I am able to check out apps & their capabilities, this project is one of my top priorities now. In order to share the time I personally spent picking quality apps, I'm making a quick (nevermind, this took me awhile) list of ones I've downloaded to date. I've only gotten free ones for now, & they're in the categories I use to group them. Probably one of my favorite apps is Relax Melodies, which is a wonderful ambient noise generator. I love using it! Although I don't really have trouble sleeping, having relaxing background noise is really nice sometimes. • Forge of Neon - draw cool glowing mult-dimensional designs, with details you can zoom into & rotate. • Shark Fingers! Free - my little nephews & friends' kids love this. You touch the screen & sharks start "biting" your finger & the water turns red w blood. Crazy. • Genesis Free - I've only played a little of this game but its very engaging. You manipulate beams of light to hit all the planets, which burst into color & activate sounds. • Beatles Trivia - I downloaded this while I was showing the phone to my Dad & we played a round. Some of the questions were tough even for him. • Fun Blast Trivia Lite - As a trivia buff, I'm inevitably going to try this type of game. • Logos Quiz Game - As a graphic designer, this is a must-have. • Hungry Shark Part 1+ - I literally just downloaded this but it's entertaining, you just eat everything in sight. • Stellarium - this app boggles my mind & makes me feel I'm truly living in The Future. You point your phone at the sky & it tells you what stars & constellations you are looking at. 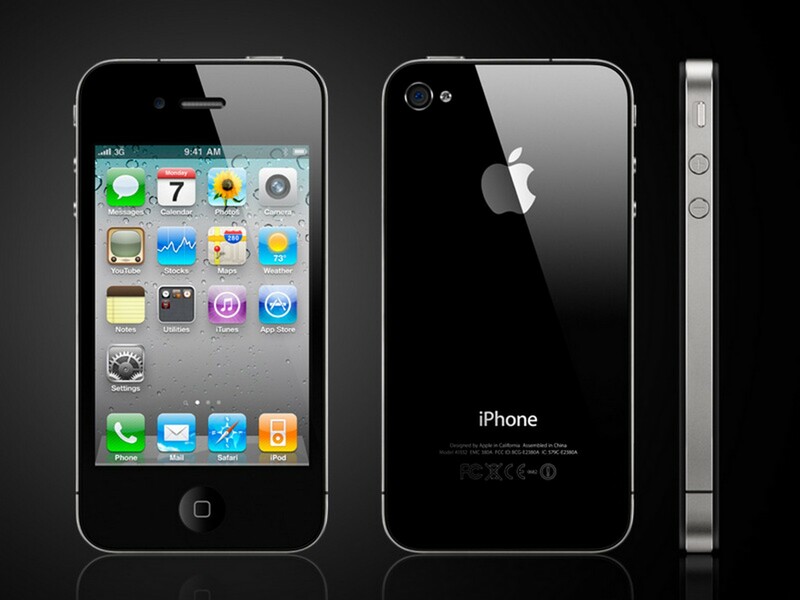 • Find iPhone - if someone is dumb enough to steal my phone, or if I'm dumb enough to lose it, this will help me find it. • Google Translate - an amazing app that confirms my lazy refusal to learn other languages. • Waze - an innovative, community-based navigation app that shows all kinds of relevant traffic info, along with it's turn-by-turn directions. This is what I'll use, at least until Apple releases their app. • Google Earth - just a virtual planet, that's all. • Musée du Louvre - an awesome timeline of artwork from the Louvre's collection. • Impressionism HD Free - a nice collection of beautiful paintings by Monet, Renoir, Degas, Van Gogh, & more. I'll probably post lists of new apps as time goes on, but these are ones that I think are worth getting so far. Last week, my old phone finally got to the point of being unusable. Since my next phone was inevitably going to be an iPhone, on Tuesday I took another step deeper into Apple's digital clutches & purchased the 4S. As much as I love technology & novelty, I also appreciate the Zen approach to simplicity. Not having a million streams of constant input can go a long way to maintaining mental calm. I was quite content with using my LG Vue only for calls, texts, & occasional lo-res pictures. I know enough people with iPhones to know its capabilities, so I was already very familiar with their awesomeness. Since I use Macs at home & at work, I also buy into Steve Jobs' lasting vision of integrated digital devices, and nobody else has achieved the superb functionality that Apple has implemented. For the past week I've been able to dig into the iPhone's features, download a bunch of apps, use it thoroughly, and think about it's pros & cons. First of all, one of the points that salespeople were making in the store is absolutely true: the iPhone is a portable computer... with functions like phone, camera, etc. After using it for a week, I'm even more awestruck at what such a compact device can do. People are making all kinds of great apps that take advantage of the hardware in creative ways. The magnetometer is used for digital compasses & Teslameters. The camera flash can be used for a bright flashlight or strobe function. The accelerometer is used for game controls. GPS is integrated with navigation apps. Combinations of these various powerful features can be used for amazing things like augmented reality software. There are alot of good apps, but I'm going to save my recommendations for another post. Even though there are plenty of games & frivolous time-wasters, there are also ones that are excellent sources of knowledge or information. Overall, the app-centered interface is simple and effective. It's a way to be packed with features, yet not have a complicated, confusing interface. I'm glad you can group apps into category icons. I'm all about organization. It's good to now have all my contacts and calendar dates easily synched between my iPhone & Mac. I've also manually transferred my various "To Do", "Graphics Ideas", "Need", & "Want" lists from my old phone to the 'Reminders' app. I use these lists constantly. I haven't transferred any music yet, but I might put a few playlists on it even though I don't think I'll use it to listen to mp3s alot. Since I use (& love) Sirius satellite radio in my car, I'm considering getting the XM Skydock for the iPhone which acts as a charger & satellite receiver for the iPhone app. The iPhone's HD camera is great & now I don't have to use my aging Nikon Coolpix camera to take decent photos. I've used the voice-activated digital assistant, Siri, to write a couple texts & look up contacts. It's a little buggy, but works pretty well for these limited uses. Although it's a developing technology, I can see it as a jumping point to where we are eventually conversing with A.I. as if they are fellow sentient beings. Maybe it's even a step to learning how to communicate with digital devices through thought alone. • The battery drains pretty fast, but I guess when its doing all sorts of cool crap, that's to be expected. You can turn apps that are running in the background off, but you don't want be stuck more than a day without a power supply. • I don't like Apple's aversion to file management for photos & video. Everything has to be managed inside the app, and you have to export an image from iPhoto to free it & make it an independent file. Apple also does this with videos in Final Cut Pro. • One physical feature I find strange is the extra switch on the side of the phone that slides [on/off] to activate [sound/vibrate] mode. This seems like an unnecessary button. There are already + and - volume buttons on the side. On my old phone you could just hold the (-) button down to lower the volume until you reached "Silent," then "Vibrate". • There's probably more nitpicky details I could find fault with, but I can't think of any right now. None these issues are really worth a damn when compared to the iPhone's outstanding overall functionality. I have to marvel at the seamless way all Apple products work together to make a productive user experience. When I think waaay back to my first personal computer, with the horrific MS-DOS/Windows3.1, it makes me feel fortunate to finally have tech that truly works to my satisfaction. I have long been a devotee of the Apple brand and Steve Jobs' vision for personal computers. The 'digital hub' consisting of devices such as iPhones & Apple computers are no less than the virtual extension of our biological brains. We are interfacing with the scaffolding of a global mind that will have results we can barely begin to imagine. As I said in my last post, at some point we are going to require multiple parallel consciousness streams to process & experience the flood of data bombarding our individual sensory systems. Last night I finally put my LG Vue to rest after 3 yrs. It worked well for most of its life, but recently the touchscreen was going crazy. I've known my next phone would be an Apple iPhone. My hand was finally forced & now I must further assimilate into the digital Borg. I'm writing this post on the iPhone 4S using Google's Blogger app. However, the features are limited & I can't even post a pic, so I don't think I'll be posting from the phone often. I'll post some more thoughts from my Mac when I get a chance. Despite its limitations, it is a truly amazing device. It is a masterpiece of design & a wonder of technology. Though I have some criticism, my overall feeling is that smartphones & mobile devices are a quantum leap toward greater enhancement of the mind & augmentation of the senses. Now all I need is an iThink to facilitate multiple streams of consciousness. Last night, I saw "Prometheus" in 3D. It is a prequel to the "Alien" movies and reveals a surprising origin to the Xenomorph aliens. It was a visually astounding movie, in which the visual experience was greatly enhanced by the 3D effects. The scenes with holographic computer displays looked amazing every time. The sense of scale conveyed throughout the movie was meant to give the impression of tiny humans isolated on a vast alien moon far away from our home planet. 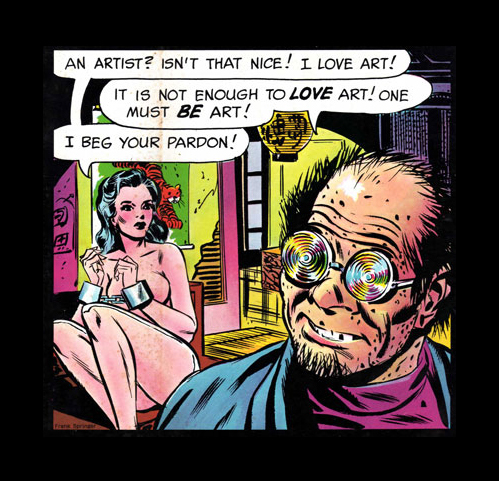 I've long been a fan of the art of H.R. 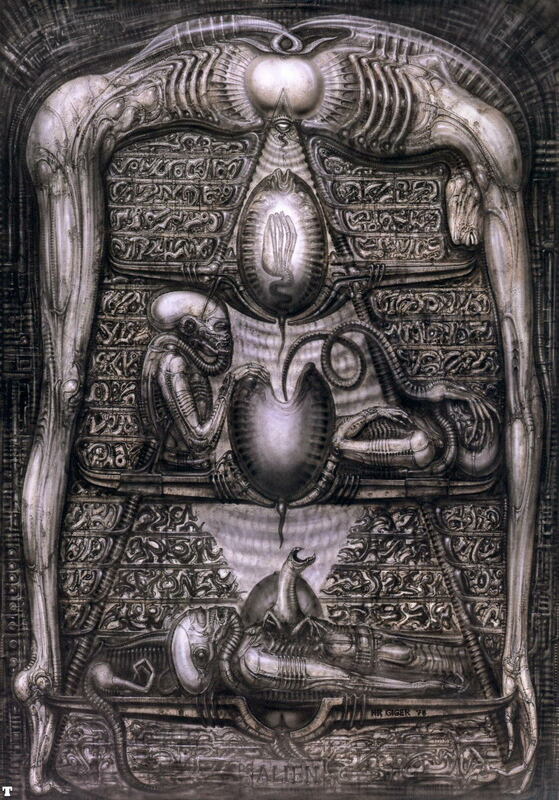 Giger, whose 'biomechanical' aesthetic and creature designs were the inspiration for the original "Alien". Giger's influence was also apparant in this movie. There was an strong contrast between the brightly-lit ship of the title, the Prometheus, and the menacing Giger-esque ancient structures the crew found on their expedition. Basically the story revolves around the highly-interconnected history between humans, the Xenomorphs, and a race of humanoid aliens, the Mala'kak (called 'The Engineers' in the movie). When you also add in the influence of the android David, the complex interactions between all of these beings in the movie makes the ideas of 'creator' & 'creation' irrelevant. Although there is a connection with the Ancient Aliens theme that's popular right now, it is done in a way that is more profound than silly. The story admittedly had a few plot points that were borderline ridiculous, even by sci-fi standards. However, the overall impact of the film allowed me to overlook these flaws and enjoy the though-provoking questions the movie raised. The fictional Alien universe is a rich source of material & "Prometheus" made it much more interesting. This was a movie well worth watching, especially if you enjoy a mind-bending blend of science fiction & metaphysical speculation. One of my brothers saw it before me & said it produced more questions than answers. If done the right way, that can be the best kind of movie. This drawing is from a cover of Evergreen magazine, showing a scene from "The Adventures of Phoebe Zeit-Geist", a comic strip from the 60's drawn by Frank Springer. This past weekend, friends asked me to join them in protests taking place around the hotel that was hosting the 2012 Bilderberg Conference, in Chantilly, Virginia. The Bilderberg Meetings are private, off the record forums attended by the members of the political, media, and corporate elite from around the globe. Critics of this secretive gathering claim that all kinds of nefarious conspiracies are being hatched from this event. I decided to spend part of my weekend to go, in order to indulge my interests in politics, conspiracies (actual & theoretical), global affairs, &, most of all, people watching. So, I drove down I-95 into Virginia where the meeting was held this year. When we got to the protest, I donned my high-tech Monkey Buddha protest disguise, specially designed to thwart advanced facial-recognition technologies being used by security. Ok, actually... it was a baseball cap & sunglasses to keep my face from getting burnt by the afternoon sun. The only other political rally I've ever been to was "The Rally to Restore Sanity" in Washington DC. That is when a massive crowd of 250,000 people gathered on the capitol mall at the behest of Jon Stewart & Stephen Colbert. It's the most people I've ever seen in one place. As you can see from the photos, that event was pure insanity. It was meant to help express a general frustration with the political state of the country. This protest was a very targeted one, however, and there were maybe 1,000 protesters at the most. It was a very lively crowd, though. There were people from many different walks of life: students, activists, vets, families, working people of all kinds, retired folks, all trying to bring some accountability to the knuckleheads running the world. There were a few people who were acting a little crazy, but overall it was pretty peaceful. A couple guys working the megaphones were from We Are Change, who made a bunch of videos confronting high-profile Bilderberg members. There were also people there from groups like The Oathkeepers, who are former military & police officers that are committed to preventing abuses of the 2nd amendment by those making & enforcing the law. The protesters were specifically trying to bring attention to the fact that all these high-level people from around the world are gathering in secret to discuss global policy matters. Despite the main concern of the protest being the secretive nature of the Bilderberg Meetings, the people there were discussing a wide variety of issues that should be getting more coverage from the corporate media. The Pied Piper of this particular movement is definitely Alex Jones, the host of the internet radio show Infowars. Although I don't listen to the show, I've been aware of him for awhile. Although he often dwells on conspiracy theories, of varying degrees of believability, he does seem to be trying to expose the tendency of those in power to create actual conspiracies. Alex is a very forceful & charismatic personality. He was being constantly followed by a crowd & made several rants over the megaphone toward the "elitist scum" inside the hotel. I can see how the cult of personality has grown around him, but it would be a mistake to rely on him for all your information. He'll drag you down the NWO 'rabbit hole' until you go nuts. Personally, I always try to assimilate a diversity of viewpoints, from both mainstream & alternative news sources. Though watching Fox News pundits usually makes me feel nauseous, I try to take even them in once in awhile, just to see drastically different viewpoints from my own. It was a very interesting experience, but I don't think it did much to stop whatever global political agendas are being implemented. That doesn't mean we can't get out there & practice our right to free speech, in protest of the greedy, short-sighted a-holes who are ruining the world. I don't have much to say about this video, it just looks really cool.